From the best blueberry muffin mix to new ways to get smart while doing your cardio, the Bodybuilding.com editors have scoured the Internet to connect you with some of the tastiest new ways to stay healthy, fit, and wise. It's that time of year when winter is starting to lose its icy grip, yet spring still feels months away. If cloudy skies, cold temperatures, and freezing rain have you feeling down in the dumps, cheer yourself up with a new book or a sweet treat! 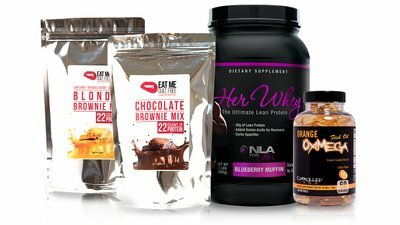 The editors at Bodybuilding.com have put our heads together to bring you our current favorite things in the fitness world. So go ahead and treat yo self—you're worth it! Hands down, NLA Blueberry Muffin Protein Powder is one of the best protein powders to bake with. Other brands can leave you with rock-hard muffins and pancakes that taste like roof shingles—not the best way to start your day. 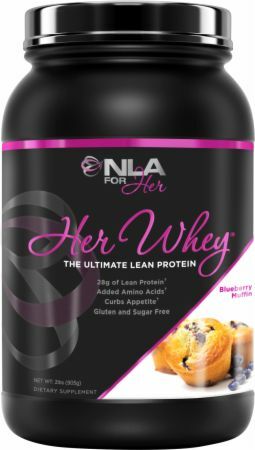 This NLA protein powder keeps your batter light and fluffy, mixes easily with just water, and even has mini blueberry pieces in it! Pair it with the classic round waffle maker from Cuisinart and you've got a quick, convenient breakfast option. I make blueberry muffins by mixing one scoop of NLA Blueberry Muffin protein powder with one serving of store-bought pancake mix, one beaten egg, and 1/4 cup water. Make a batch of these on the weekend, freeze them, and have them ready to go for the week. If you only know Dave Draper as a blond-haired, broad-shouldered set piece in countless golden-age bodybuilding photos, you're in for a treat. The Blonde Bomber isn't just a blast from the past; he's also one of the most electric, forceful voices in lifting literature—even today. Draper's new collection of musings, memories, and muscular wisdom, "Iron in my Hands," is the type of book you can open to any page and find a sentence you simply must read out loud to a fellow devotee of the lifting life. Sure, you'll find the sets and reps of his preferred arm workout, but far more importantly, you'll get to ride shotgun in the mind of someone who has been doing this—and pondering it deeply and profoundly—for longer than most of us have been alive. It’s a wild ride and a wild read. As renowned strength coach Dan John notes in the foreword, "No one else writes like this. No one else has the life experience, the insights, and the intuition. Trust him." We do! Eat Me Guilt-Free brownie and blondie mixes lets you have your dessert and crush your macros, too. We're talking 22 grams of protein in a single brownie, plus no sugar and only 5 grams of carbs. You know you're curious, and you should be! The big portions and rich chocolate or vanilla flavor will be enough to satisfy your sweet tooth, and the preparation is crazy simple: Just add egg whites and coconut oil to the already short list of ingredients—chocolate whey, Stevia, unsweetened cocoa powder, and baking soda—and you're ready to soak up the clean gains. Fish oil is good for you, right? If it weren't for that taste of fish haunting you throughout the day, you'd do the right thing and make it part of your supplement stack. Well, fear the fish burp no more! With 800 milligrams EPA, 400 milligrams DHA, and a citrus enteric coating, OxiMega fish oil capsules by Controlled Labs pack enough omega-3 fatty acids to support mood, bone health, and optimal cholesterol levels—and do it without the taste of sardines lingering in your mouth. If you didn't know that Bodybuilding.com has a podcast, that's OK. In fact, it's a good thing, because it means you've got enough unheard episodes to power you through at least your next 10 cardio sessions! In this strength and fitness roundtable, hosts Nick Collias and Krissy Kendall talk to elite bodybuilders like Evan Centopani, powerlifters like Mark Bell, fitness models like Lais DeLeon and Andy Speer, and overall badasses like Layne Norton. Nick and Krissy even dig behind the headlines to discuss the safety of creatine and the many uses of the ketogenic diet. Plenty of laughs, plenty of learning, plenty of lifting—this is what you should be listening to.